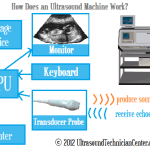 An ultrasound scanner consists of a number of components including a transducer probe, a central processing unit (CPU), a monitor, a keyboard with control knobs, disk storage devices, a printer and so on. The most essential component is the transducer probe. 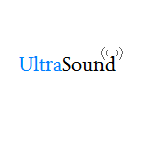 This probe both produces the sound waves used in ultrasound and receives their echoes back. It does so by taking advantage of a scientific phenomenon called the piezoelectric effect, also known as the pressure electricity effect. First discovered in 1880 by Pierre and Jacques Curie, this effect causes quartz crystals contained in the ultrasound probe to vibrate rapidly and send out sound waves, which are mechanical pressure waves, when an electrical current is applied to them. This same effect also causes the crystals to give off electrical currents when the reflected sound waves from an ultrasound test echo back to them. This is how quartz crystals in an ultrasound probe can both send and receive ultrasound waves. Probes use sound-absorbing material so that they do not re-reflect sound echoes, and they employ acoustic lenses to focus and direct the sound waves. The ultrasound technician applies a mineral-oil-based ultrasound gel to the patient’s skin before doing an ultrasound scan. Ultrasonic waves do not travel well through air, and the gel allows sound waves to be transmitted from the probe through the gel directly to the patient’s skin. Linear probes produce high frequencies and generate high-resolution images but do not penetrate deeply into the body. Abdominal or curvilinear probes penetrate more deeply and have a wide footprint for capturing larger structures. Phased array or cardiac probes have a small field that can transmit between ribs and thus avoid rib shadows on images of that region. Probes attach easily to a central processing unit or main computer of an ultrasound machine. The CPU transmits electrical currents that cause the probe to emit sound waves. The CPU also analyzes electrical pulses that the probe makes in response to reflected waves coming back. It then converts this data into images that can then be viewed on an accompanying monitor, stored on disk or printed. Ultrasound scanners also include control knobs, buttons and other command features on the CPU to enable the sonographer to make adjustments, save images and perform other tasks. 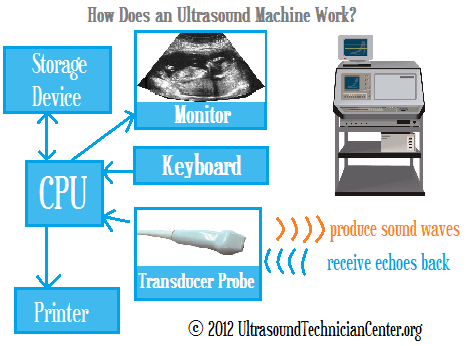 Till now, you should know how an ultrasound machine works. 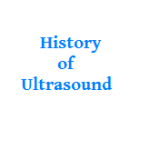 Ultrasound machines are widely used diagnostic tools. 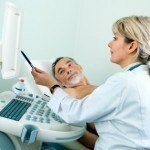 Are you wondering if ultrasound is harmful for your body?